How well do you understand the value of your company’s intangible assets? When you think about a company’s value, what comes to mind? If you’re like most people, you immediately think about tangible assets. But have you given any consideration to a company’s intangible assets? They’re part of a rapidly growing trend in the corporate valuation world. Tangible assets are physical things. Tangible assets include both fixed assets, such as machinery, buildings and land, and current assets, such as inventory. The opposite of a tangible asset is an intangible asset. Intangible assets are not physical in nature. Intangible assets are the results of human intellect and work. Intellectual property (items such as patents, trademarks, copyrights, business methodologies), human capital, reputation, brand recognition and customer relationships are all common intangible assets in today’s marketplace. Ocean Tomo, a merchant bank focused on intellectual capital and intangible assets, publishes an annual study of intangible asset market value. In its 2015 study, the firm published the astonishing chart above. 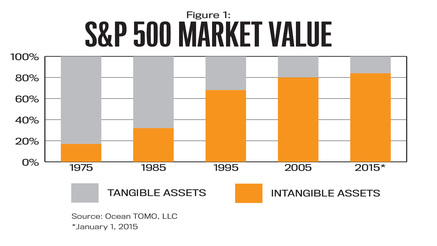 According to Ocean Tomo, the financial value of tangible and intangible assets has completely reversed in the last 40 years. In 1975 tangible assets comprised 83% of the S&P 500 market value; in 2015 intangible assets made up 84% of the S&P 500 market value. To truly understand the value of the intangible assets of your business it’s important to conduct a thorough assessment of these assets of your company. Intangible assets include the company’s: 1.) strategic capital, 2.) human capital, 3.) intellectual capital, and 4.) social/relationship capital. A holistic assessment of these intangible assets and how they interconnect with one another will provide an understanding of where these assets are either creating - or destroying - value for your company. Intangible assets are the true drivers of business performance, competitive advantage and ultimately, of value!